Attend a very special screening of the multi award-winning documentary about the life and music of guitarist extraordinaire Jason Becker, Jason Becker: Not Dead Yet, along with live musical performances by internationally-known hard rock and heavy metal guest musicians, in a benefit Not Dead Yet: Movie and Music to End ALS for the Jason Becker Special Needs Trust and ALS Therapy Development Institute (ALS TDI), Thursday, September 19, 2013 at Bimbo’s 365 Club. Doors are at 6:30 p.m. with showtime at 7:00 p.m. 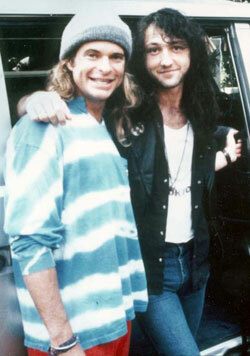 In 1990, 20-year old guitarist extraordinaire Jason Becker, after already recording two full-length albums of his own, was selected to play guitar for David Lee Roth - a position previously held by two of the greatest guitarists ever; Steve Vai and Edward Van Halen. Jason went on to record DLR’s third solo album, A Little Ain’t Enough, released in April 1991, was voted Best New Talent by Guitar Magazine by April of the very same year, and was about to begin a world tour that would make him an international guitar superstar when Becker began to feel what he called a "lazy limp" in his left leg. Doctors who soon diagnosed him with Amyotrophic Lateral Sclerosis (ALS; Lou Gehrig's Disease) said, not only would never make music again, he wouldn’t live to see his 25th birthday. Over two decades later, now confined to a wheelchair and without the ability to move or speak, Jason – considered by many to be the 'Stephen Hawking of music' - is very much alive and making music via the computer he controls only with his eyes. Join Jason Becker and musical friends in a very special celebration of his life and music, with musical performances during intermission and after the screening by Pearl Aday and her band, PEARL, featuring guitarist (and husband) Scott Ian of ANTHRAX, guitarist Jim Wilson of MOTHER SUPERIOR and Henry Rollins' ROLLINS BAND, bassist Joey Vera of ARMORED SAINT and FATES WARNING, the San Francisco Bay Area’s FORREST DAY, and special guests. $50 General Admission tickets include a light dinner buffet (while supplies last) and $75 VIP tickets include the dinner buffet, as well as reserved seating, a signed event poster and a meet and greet with Jason Becker and all the participating musicians. 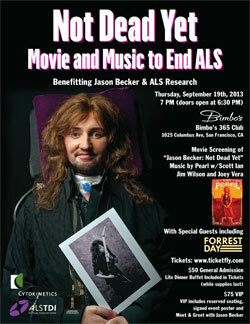 When: Thursday, September 19, 2013, doors at 6:30 p.m. Showtime at 7:00 p.m.
For more info about Jason Becker: Not Dead Yet and to watch a preview, please visit: http://www.jasonbeckermovie.com. Visit http://www.jasonbecker.com to hear and purchase Jason Becker’s music.